Formerly the ‘Land of the Long White Cloud’, New Zealand may as well now be renamed Middle Earth, as you can’t swing a dwarf without hitting some kind of Hobbit-based advertising or paraphernalia. I need this sign on my gate at home. It started in Los Angeles, where there was a decal of gold coins and hobbit feet leading to the check in counter for Air New Zealand. On the plane the safety video is hobbit-themed. Then you arrive in Auckland where everything has a touch of Tolkien. And who can blame the kiwis? Apparently the films have brought four *billion* dollars of revenue into the country. 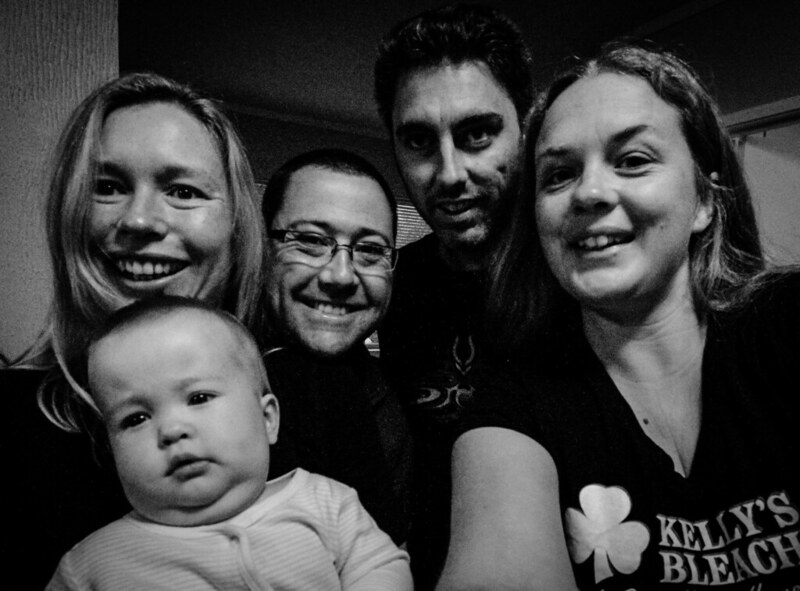 We had plans to head to Hobbiton, but first we spent a night with our friends Lauren, Nick and their baby Annabel, who is possibly the happiest tiny person I’ve ever met. She barely stopped smiling the whole time we were with them and was a great deal of fun to play with. Nick and Lauren had very generously offered to loan us their car so we headed out into the lush, green dairy country south of Auckland. 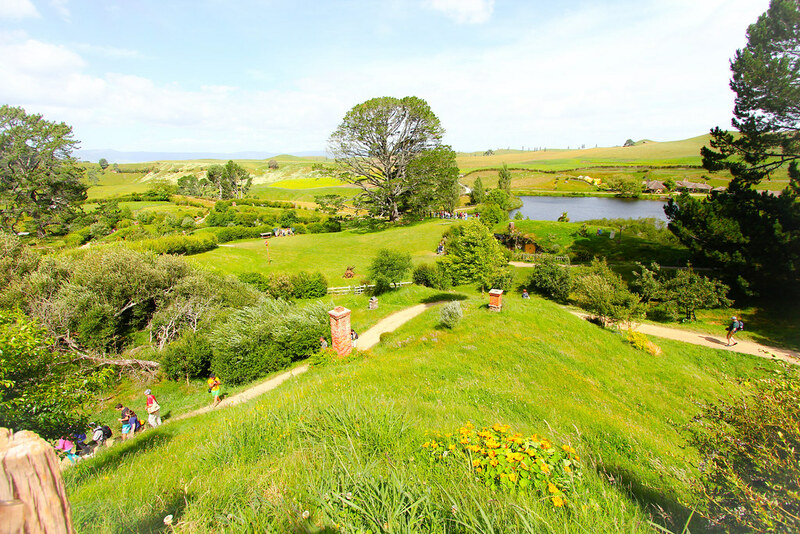 The Hobbiton set is about an hour and a half south of the capital city and work is currently underway upgrading the cafe and gift shop where you wait for the tours to depart. Groups leave every half hour and the price of the tour is $74. Quite steep, given that you get two hours to walk around and a drink in the Green Dragon – and that’s it. It was about the same price as our whole day at Universal Studios. We asked our guide how much it cost to keep the property running and he told us that it was about $150,000 a month. Aside from the guides and staff who man the shop there are also full time gardeners maintaining the vegetable and flower gardens. Disappointingly, the only thing behind the door was a small empty space. 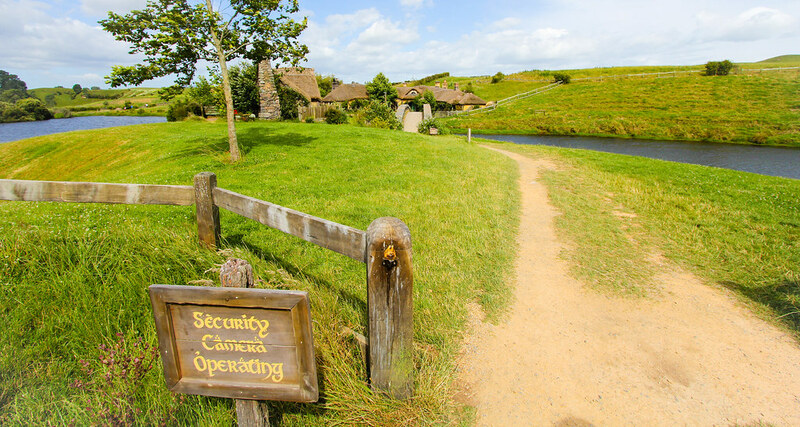 We were lucky to get a nice day but wished we’d gone with the first morning group – less people wandering into shots and the sun would’ve been shining onto Bag End rather than behind the hill. We heard very interesting stories about Peter Jackson’s attention to detail and saw a tree which has been brought in from another property and had all the leaves made of fabric and then individually attached to give the desired effect. A tiny hobbit hole to use for optical illusions. There were over 40 house front on the property. 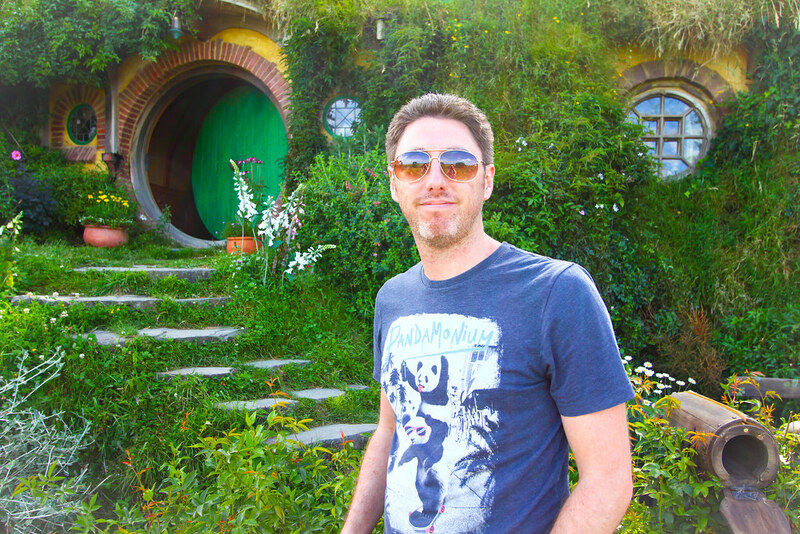 The most famous hobbit hole of them all. If you’re a Lord of the Rings nut then it’s worth the trip but I’m not sure I’d recommend a visit to everyone. The path to the Green Dragon. The drinks you get there are only available on site and are brewed in NZ. We spent the night in Rotorua, where hot springs bubbled in the middle of town, and then drove up the eastern prong of the north island – the Coramandel Peninsula. We stopped for a delicious lunch in one of the many pretty little towns along the way and arrived mid afternoon at Hot Water Beach. Two hot springs run beneath the sand, so during low tide it is possible to dig your own spa right on the beach. We arrived to find a horde of people concentrated in the optimal positions and so we just walked around a bit, dipped our toes in various pools and laughed at people getting splashed with cold water when the tide started to come in. After a while all the digging to provide a place to relax started to seem counter-productive. There was one spot where the water was boiling up through the sand, bubbling quite merrily. While a group of people were standing around watching it, a woman blithely walked right into it and scalded her foot. Strangely there were many signs warning of rips and dangerous currents in the sea but none warning of the steaming water under the sand. That little rough patch to the left of the sign is the bubbling sand. We didn’t spend all that long on the beach as we didn’t feel like getting wet, so we drove back to Auckland that night and stayed with Lauren and Nick for our last two nights. I’m afraid they must’ve thought us rather dull company as we had no ideas about what to see or do and were perfectly happy to sit on the couch and organise our final bits of travel for when we got back to Australia. They did manage to prise us off the couch to visit some markets and gardens, go out for a delicious brunch and on our last night we took a box of fireworks Nick had been hoarding and let a few off in the park over the road. It’s only legal to buy fireworks for three days a year but you can let them off any time you like – within noise restriction times, I suppose. Annabel coped pretty well with the fireworks and didn’t seem at all perturbed by the noisy ones. It was the ones that looked like showers of sparks that caused some grizzling so we packed up and went back inside. We had a lovely time in New Zealand – I regret to say it’s a country I’ve never been much interested in as I thought it’d be much like Australia. Turns out that in some ways it is – but in terms of scenery it’s far more dramatic and lush than much of the landscape you’d see in Oz. Next time I’ll definitely be heading to the south island to see what all the fuss is about. Thanks for a lovely time, Lauren and Nick! We can’t wait to see the delightful Annabel again next time you’re in Oz. 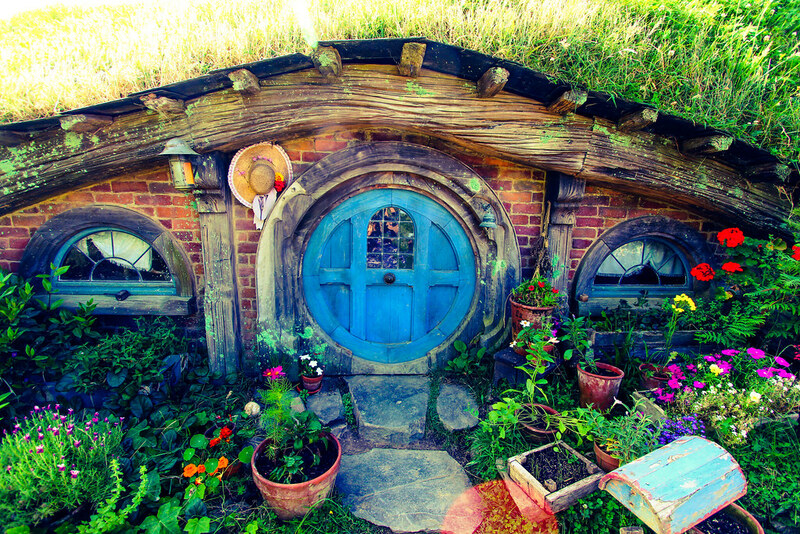 I think I should like to live in a hobbit hole. me too! Apparently you can tell the wealth of the hobbit by the number of windows. 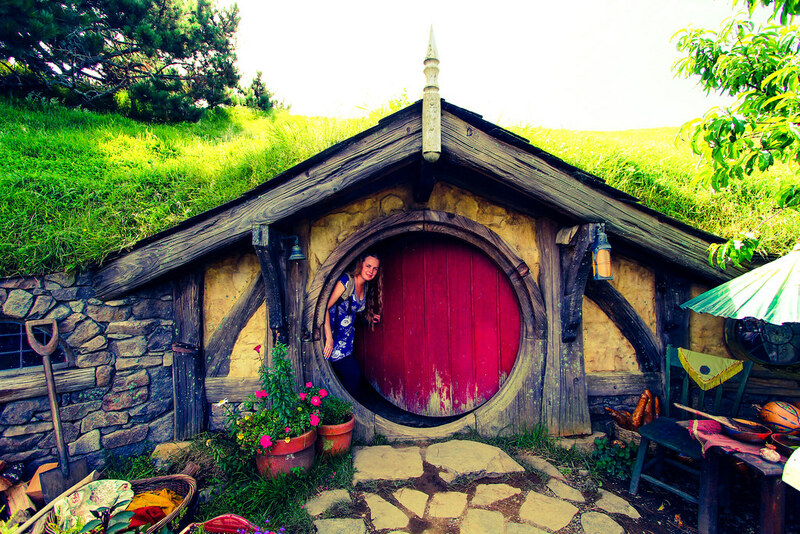 One poor hobbit had no windows at all! Pete and I road-tripped around the north island the last time we were over there. We spent a week with mum on the station and then flew up north. If we can sort out the logistics, it would be fantastic for you and Luke to come with us to spend some time on the property with mum & Craig. We could stay in the shearer’s barracks and have our own kitchen/living area and huge fire place. Have a look at my photos on facebook, it’s pretty amazing country – she is 2.5 hours Northwest of Christchurch, in the foothills of the Southern Alps. I’m quite keen to visit NZ: some of the hiking on the South Island is apparently spectacular, and with excellent lodges on the routes that mean you don’t have to camp and can have a hot shower each night. If I go home again I’ll save up for the fares and a new camera and go exploring! 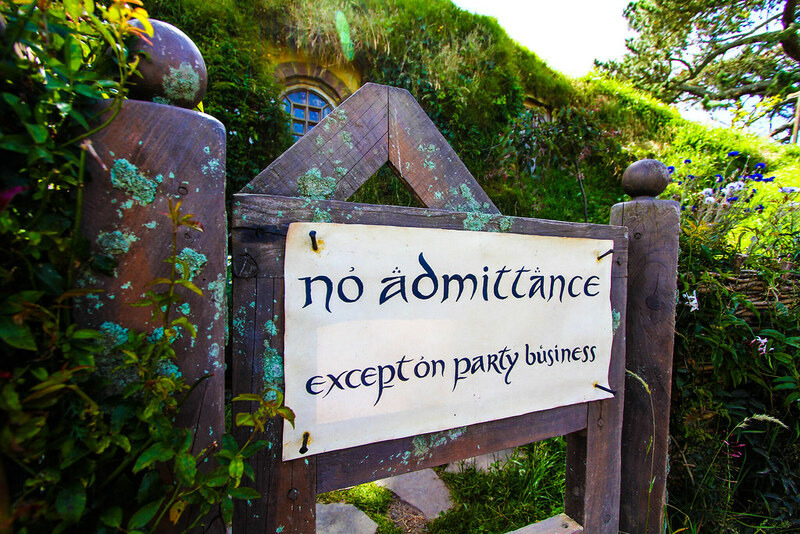 Think I’ll skip Hobbiton though! Welcome home. I can imagine how amazing that would feel. Once I get myself into shape I’m thinking of doing some multi day hikes here… New Zealand would be something to aim for! Recouping finances is also high on the priority list;). Being home is pretty great – apart from seeing people I’ve been so happy to have my whole wardrobe at my disposal… and today I planted things in the garden and it made me so happy!